Easy to assemble and disassemble, easy to carry with one carrying bag and space saving. With four 23cm long U-shaped stakes and 22 magic tape straps for more sturdy and security. High impact, Welded firmly allows taking thousands of the hardest shots. Suitable for use in the yard, club or school, for fun and enjoyable. Sturdy frame constructed of powder coated steel tubes. Hook and loop tapes to fix the net firmly. Anchors and ground nails to secure the goal firmly on the ground. Build your own soccer ground in the yard or school. 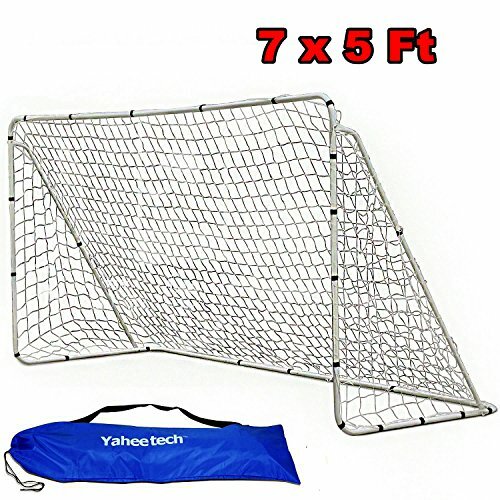 Material: Steel Tubes, PE net;Size:7' x 5' x 2.5' (L x H x D). Tube Dia. : 25mm /0.1";Stake Length:9";G.W.:12.5LB. Franklin Sports 3' Insta Soccer Goal Set, Neon Green, 36" x 24" x 24"